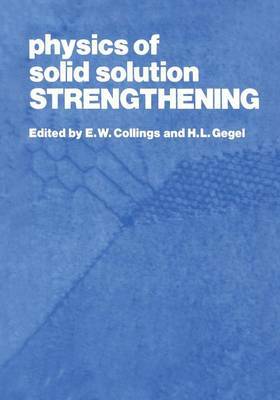 This book is the proceedings of a Symposium entitled "The Physics of Solid-Solution Strengthening in Alloys" which was held at McCormick Place, Chicago, on October 2, 1973, in association with a joint meeting of the American Society for Metals (ASM) and The Metallurgical Society (TMS) of the American Institute of Mining, Metallurgical, and Petroleum Engineers (AIME). The symposium, which was initiated and organized by the editors of this volume, was sponsored by the Committee on Alloy Phases, Institute of Metals Division, TMS, AIME, and the Flow and Fracture Section of the Materials Science Division, ASM. The discipline of Alloy Design has been very active in recent years, during which considerable stress has been placed on the roles of crystallography and microstructure in the rationalization and prediction of properties. Underestimated as a component of alloy design, however, has been the importance of physical property studies, even though physical property measurements have tradi- tionally been employed to augment direct or x-ray observations in the determination of phase equilibrium (and, indeed, metastable equilibrium) boundaries.